The arrival of a value-based care paradigm provides HIM professionals with an opportunity to expand their roles. CMS and the AMA provided some leeway to physician practices, but it has not entirely put provider fears to rest. Really, what's a new year but a random cutoff point? Nevertheless, Journalism 101 requires us to take a peek at how 2016 is shaping up. Placing an emphasis on meeting market needs has helped HIEs become a valuable tool in a health care environment laden with federal requirements. No matter the purchase type, everyone wants to get their money's worth. How can health care consumers be sure they're receiving value from their provider? 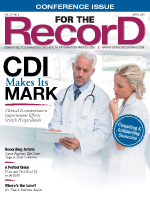 Some ICD-10 codes improve reporting; others are just different. And then there are those that may leave coders scratching their heads. To be difference-makers, clinical documentation improvement specialists must have the proper tools and resources. Who was and who wasn't present on the exhibit floor at this year's AHIMA conference offered clues about the HIM industry's future. 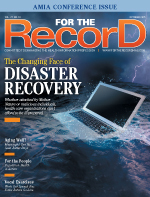 A physician gives his take on the state of EMRs. Hint: It's not pretty. When it comes to protecting EMR data, health care organizations must get with the times and deploy a full arsenal of defenses. Get the lowdown on health care's facts and figures. How a physician query is delivered is secondary to when it's delivered, experts say. 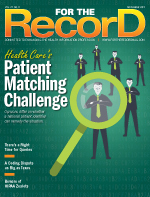 Thought leaders are divided on whether a national patient identifier can remedy the situation. For two decades, Texas providers have waged battle with the OIG over the agency's approach to Medicaid utilization review. Misinterpretation of the law can damage patient relationships and lead to poor health outcomes. Meeting the sticky requirements of medical necessity can be boiled down to precise documentation. Terminology management plays a key but sometimes overlooked role in meaningful use aspirations. Introduce "Web bots" into your revenue cycle operations and watch how claim status functions become much more manageable. Clinicians need to spend time working in the system prior to go-live in order to decrease resistance rates. Whether it be a malicious attack or a force of nature, health care organizations can't afford to be ill-prepared to deal with modern calamities. For various reasons, it would be too costly to scrap the incentive program, but few have anything good to say about its past or future. Progressive organizations are exploring strategies to use data for the purpose of improving community health. One of health care's most valuable commodities, data can be rendered useless if the patient narrative isn't included. Epic and Nebraska Medicine have joined forces to turn the Apple Watch into a health care tool. 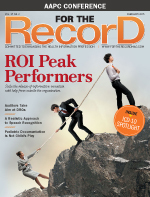 Learn how to make your EHR a worthwhile investment. As connected devices and services become the norm in health care, the reliability of Wi-Fi networks takes on added significance. Patients telling their stories through online videos can have a profound effect on patient engagement rates. More health care organizations are using EHR data to discover how they may better serve patients. In a sort-of old-school move, two HIM departments have taken a hands-on approach with their physician staff. A recent white paper addresses the perceptions associated with scrapping in-house programs. Enterprise content management has developed to the point where it's now a key component of fully integrated EHR adoption. While computerized practitioner order entry has been knocked for its inability to control alarm fatigue, there are ways to overcome the issue. When it comes to hiring hospital inpatient coders, don't be penny wise but pound foolish. An enterprisewide communication platform can do wonders to promote better care and improve patient satisfaction scores. 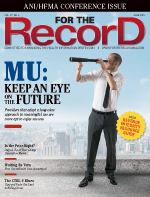 Higher learning institutions are teaching HIM students the finer points of EHR technology. 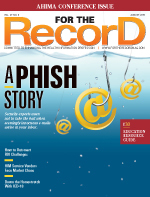 Health care data thieves can snag their unsuspecting targets by taking them on a phishing expedition. By following some basic tenets, health care organizations can stress less about their release of information processes. The Office of Inspector General is approaching these reviews with a renewed fervor and an eye on security concerns. 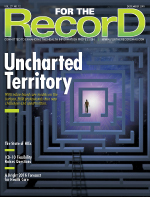 Certified EHRs and ICD-10's arrival have made life more difficult for HIM service vendors. Demands from millennials promise to have a far-reaching effect on how health care providers view mobile technologies. Health care organizations must have a documentation plan in place in the event their EMR goes down. An industry expert analyzes where the industry stands as it heads down the homestretch toward October 1. This Will Go On Your Permanent Record — Or Will It? The value of documenting physician queries in patient charts is up for debate. If not properly managed, hospital mergers can wreak havoc on organizational workflows. A recent study shows that dictated reports need quality assurance steps to maintain data integrity. Short-Stay DRGs: Fix or Fiasco? Industry experts question whether tying short inpatient stays to diagnosis-related group payments is a good idea. HIM professionals looking for a different career path may want to consider becoming a patient advocate. An industry veteran offers advice on how women can boost their chances of landing leadership positions. New Mexico community colleges are taking the lead in replenishing the state's supply of qualified health care professionals. The introduction of ICD-10 will affect many hospital areas, but the emergency department figures to be among the hardest hit. 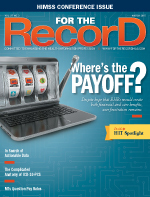 Experts say viewing meaningful use as an IT project defeats the program's purpose and limits long-term gains. Today's case managers serve the interests of payers, providers, and patients while keeping regulatory factors in mind. A Chilmark Research report finds patient engagement efforts are taking a backseat to other HIT priorities. By failing to keep on top of their charge description masters, organizations risk losing revenue. A professor has developed an ICD-10 tool that hopefully will fill in the gaps of general equivalency mappings. The advent of valued-based care forces health care organizations to reevaluate their revenue strategies. The use of copy and paste can lead to physicians billing for work done by someone else. 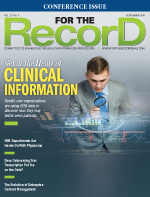 Organizations trading in an old EHR for the latest model must take steps to ensure a smooth data conversion. Many of the functions necessary for an information governance initiative are already taking place throughout an organization. The growing popularity of data analytics initiatives further complicates an already foggy concept. Inpatient rehabilitation facilities face numerous hazards in their battle to stay on the good side of recovery auditors. Offering medical students the chance to become familiar with EHR systems may lead to long-term gains. Mobile technology is poised to change transcription workflow. The perfect storm is brewing for another transformation of the HIM profession. A small survey of chiropractic interns shows a general lack of knowledge about HIPAA regulations. 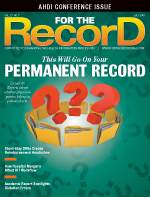 Smart health care organizations will treat ICD-10 testing as more than a pro forma exercise. While clinical documentation improvement projects enjoy success, organizations must be careful not to spread staff too thin. Inundated with EHR data and complicated regulations, cancer registrars have seen their roles expand significantly. Are consumers who ask for health information disclosures actually requesting access? It's up to providers to educate patients on the differences. Speech recognition that lives seamlessly with electronic records can make life a lot easier for busy physicians. 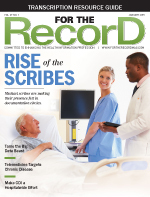 Clinical documentation improvement efforts boost hospital operations in various ways. Instead of dreading audits, embrace the process by putting a positive spin on the experience. In the future, there may be a potential fraud deterrent sitting right in your wallet. 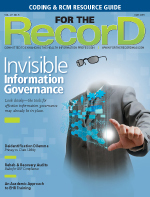 Two industry experts discuss the viability of health information exchanges. University of Missouri Health Care patients have gained online access to physician notes through the system's patient portal. Despite design flaws, EHRs add value to health care. Nevertheless, experts say the technology is capable of much more. What has prevented coders from feeling comfortable with PCS? What needs to change in order to boost coder confidence going forward? Medical transcriptionists believe their compensation doesn't match their contributions. As the bytes pile up, health care organizations must be able to sift through the more appetizing pieces to gain value from their cumulative information. Develop effective strategies to get the most out of consulting services. Sacrificing accuracy for speed can lead to misleading data becoming part of public health reporting and other metrics. Texting can be an efficient mode of communication, but health care organizations must be aware of its potential security issues. Researchers found that tweets expressing negative emotions such as anger and stress were associated with higher heart disease risk. In an effort to curb unnecessary blood transfusions, a health care organization has embedded a "best practice alert" in its EMR. Harried HIM departments may want to consider outsourcing all or part of their release-of-information functions to a third party. By being aware of what the technology can and can't do, health care organizations are more apt to achieve the desired results. Health care organizations must brace themselves for the inevitable perusal of their coding. Four industry veterans talk about the skills necessary to master this demanding, ever-evolving position. HIM professionals looking to gain access to the C-suite must believe in themselves. Big Data get most of the ink but it's foolhardy to ignore the importance of quality standards for small data. Pediatric documentation presents a unique set of challenges to the HIM professionals responsible for maintaining its accuracy. An Orlando children's hospital sends text messages and images via a smartphone app to keep loved ones informed during surgery. Busy physicians struggling to stay in step with documentation requirements may find medical scribes to be a welcome addition to their staff. Experts say health care organizations both large and small must have a strategy in place to manage an influx of data. Researchers analyze how the technology affects cost, access, and quality of care. A hospitalwide effort built on cooperation increases an organization's chances of upgrading its documentation. Get a jump on the buying process by asking these questions. When it comes to accurate documentation, an industry leader says not to let EMR technology trump the skills and expertise of a medical transcriptionist. Population health management is rapidly becoming a viable career option for HIM professionals. Learn how business process management technology can help reduce costs and improve outcomes. CFOs at small hospitals are finding meaningful use investments are taking a toll on their bottom line.